Simple MySensors WeMos Mini gateway shield with support for 3 radio modules: SMD NRF24L01+, SMD PA+LNA NRF24L01+ or SMD RFM69HW. PCBs.io 4 for $5.52, black 1.2mm PCB, ENIG finish. OSHPark.com 3 for $6.90, purple 1.6mm PCB, ENIG finish. Simply solder your favorite radio module to the corresponding trace and a 4.7 to 47µF SMD 0805 capacitor on the top side of the PCB. It is also recommended to solder the 0.1µF and 10µF SMD 0805 capacitors but not required unless you add some of the optional components. 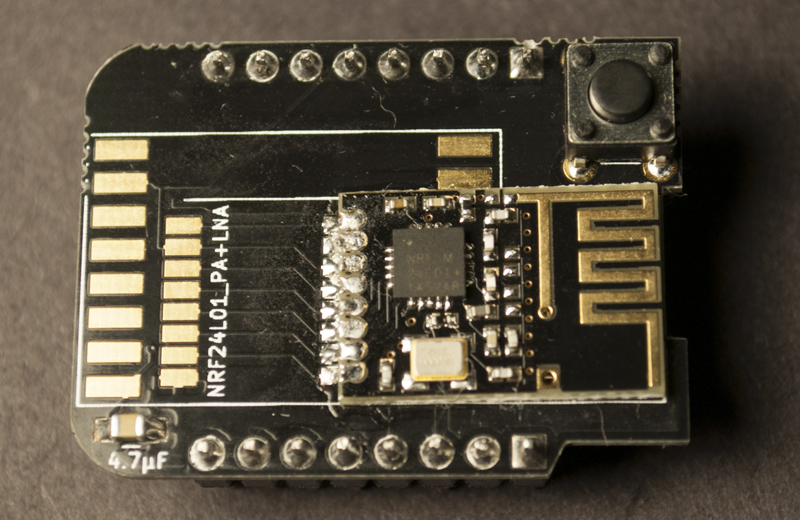 You should not need to add this, but if you are using an amplified radio module (such as a PA+LNA NRF24L01+) you may experience Tx errors. If the WeMos power regulator do not provide enough current for your radio you can add an additional AMS117 regulator between the 5V and 3.3V circuits and a 10µF SMD 0805 capacitor between 3.3V and GND. If you have a compatible controller you can add an inclusion mode button. Plug the shield on top of your WeMos Mini. Do not forget to edit the various options of the Arduino example code before uploading it. 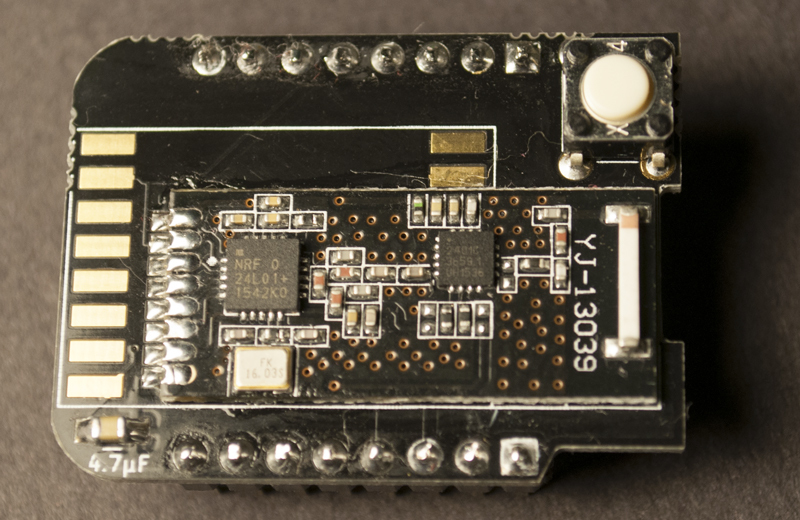 Adapted from MySensors Security & Signing SecurityPersonalizer sketch with pin assigned for this shield. Shields are stackable and additional ones can be added on top / below the WeMos to introduce new functions / sensors to your gateway. As a note, keep in mind that an ESP8266 tends to be warm while in use, a temperature probe won't be accurate if too close. For best radio performances it is recommended to have the radio shield on the topmost position. 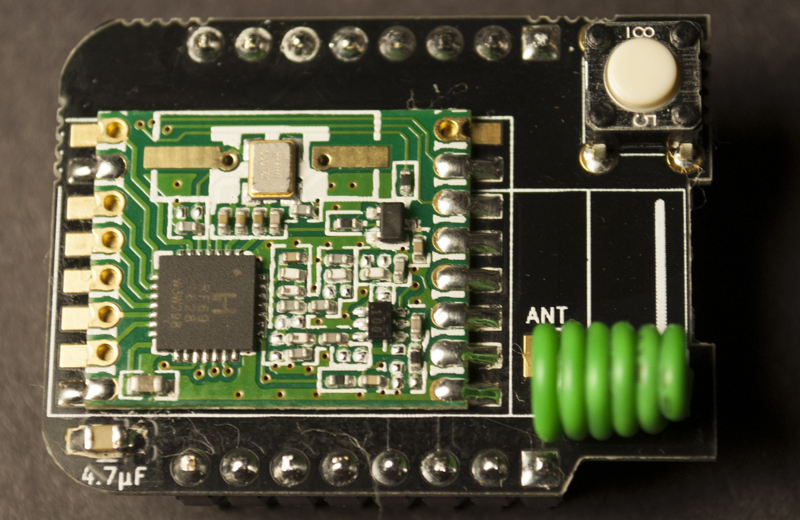 A0 (Analog input, max 3.3V input) is available if you don't use software signing. 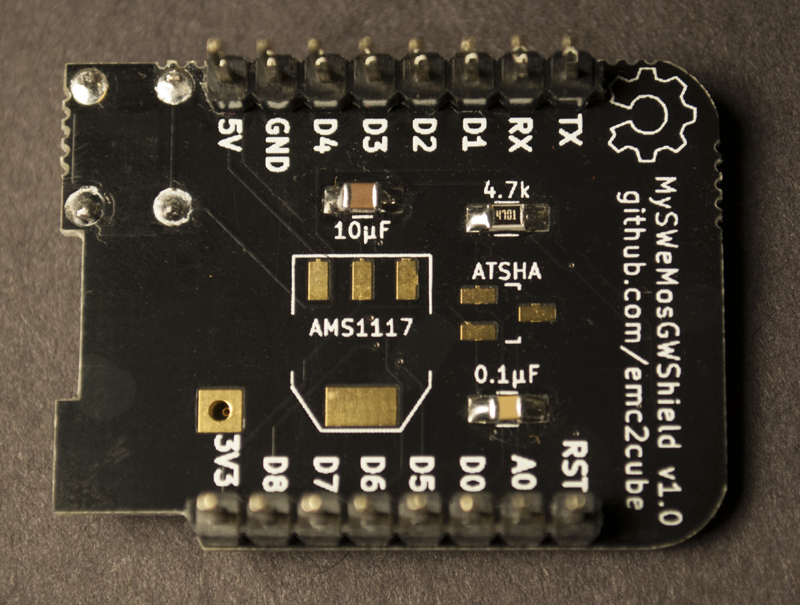 D0 (GPIO16, IO) is available if you don't add/use an ATSHA chip for hardware signing. D1 (GPIO5, IO, SCL) is always available. 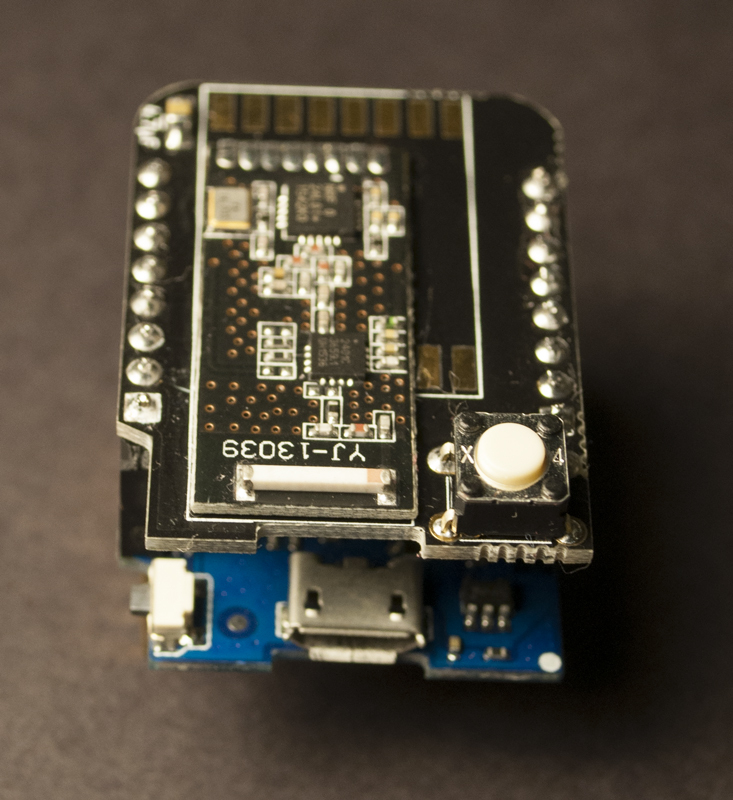 D3 (GPIO0, IO, 10k Pull-up) is available if you don't use an inclusion mode button. D4 (GPIO2, IO, 10k Pull-up, BUILTIN_LED) is available if you don't use flash leds on rx/tx/err. TX (GPIO1, TXD) is always available but used for serial communication. RX (GPIO3, RXD) is always available but used for serial communication. 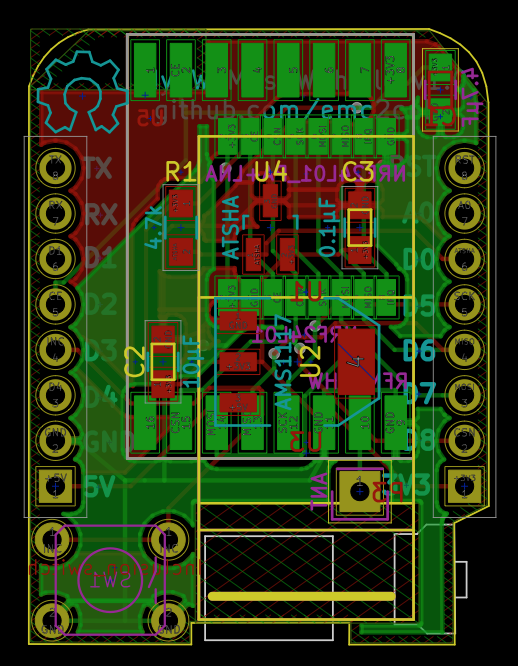 This project use the Kicad footrpints and templates for wemos D1 mini board library.